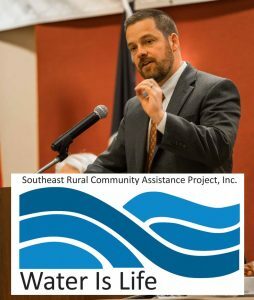 On April 11, 2018, Daniel McLaughlin gave the keynote address at the Southeast Rural Community Assistance Project (SERCAP) Water is Life! Conference & Luncheon. SERCAP is dedicated to ensuring that all residents of the southeastern United States have adequate access to clean, safe drinking water and environmentally sound wastewater solutions. SERCAP’s individual programs and services focus on low-to-moderate income individuals living in rural communities throughout the organization’s seven state region. SERCAP provides grant and loan assistance to individuals to help solve water and wastewater challenges.